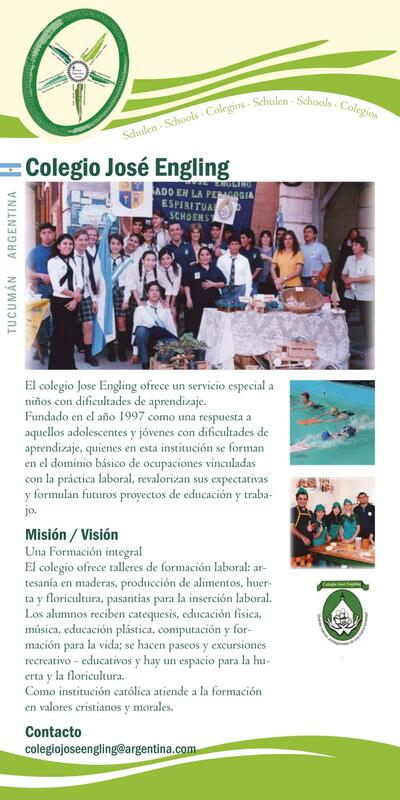 The Joseph Engling College was founded in 1997 to care in a special way for children and young adults with learn- ing difficulties. The students are taught a basic mastery of occupational activities, attune their expectations and formulate training and work possibilities for the future. Holistic education The school offers technical training in woodwork, the produc- tion of food, planting vegetables and flowers, and practicals in preparation for starting work. The students study the cate- chism, sport, music, art and informatics, as well as education for life. There are hikes and excursions that have a recreational and formative character, and the vegetable and flower gardens have a definite place in their day. As a Catholic institution we pass on Christian and moral valu- es. Whoever wants to can enter into the covenant of love with Mary and receive their First Communion and Confirmation.